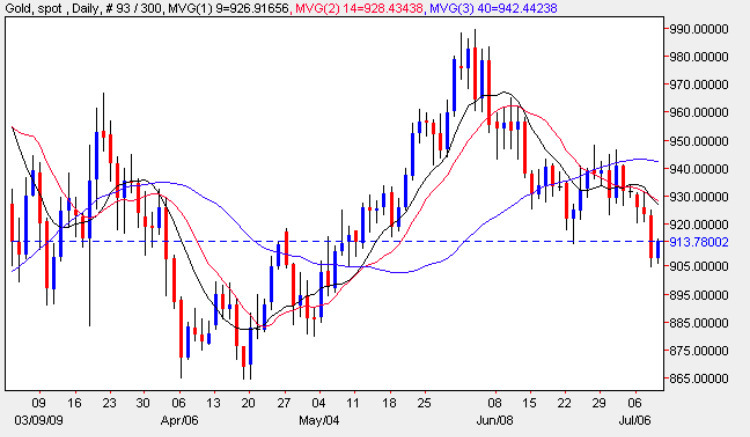 Yesterday’s price action on the gold chart was extraordinary for spot gold prices which managed to lose $15.42 to close just above the $900.00 per ounce price point on a day when markets were essentially drifting owing to a lack of any hard news and with no appreciable strengthening of the US Dollar. The current market torpor is partly attributed to the lack of Chinese involvement in the G8 summit, which has removed the US Dollar discussion from the agenda where it was originally thought to be a high priority. It is therefore somewhat surprising to see such a significant move in the price of spot gold. From a technical perspective yesterday’s candle merely confirmed the bearish picture outlined in yesterday’s market commentary where Tuesday’s candle found the 9 and 14 day moving averages an impenetrable barrier, and therefore yesterday’s wide spread down bar came as no great surprise although the depth of the move was unusual. The close of the day finished deep into the strong support area between $900 and $920 and with such a congested price zone it will now take some considerable momentum for the price of gold to break higher. With all three moving averages now turning lower and with the congestion now significant trading opportunities should be biased to the short side with any reversal higher seen as an entry opportunity to trade. My suggestion is therefore to look for entry positions in the hourly chart and any stop loss should be set wide and certainly above the previous resistance at the $940 price point, or higher. The short term trend is bearish, the medium term trend is sideways while the long term trend is bullish.